ferrari original or self made??? In Model Cars > Pedal Cars > Show & Tell and Classic Cars > Show & Tell. 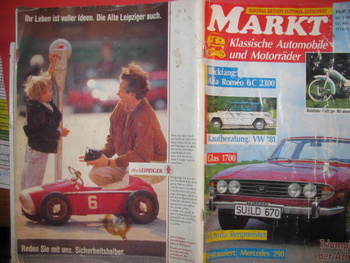 ive bought the toy in 1984. ive seen it on the german veterama market. the seller wanted to have 800 german mark. very expensive at that time. i wanted to deal and left his shop several times. he did not care. the seller did to gave me just one penny discount. what could i do? NOTHING. ive felt in love already. from the first second ive seen it i knew i want to have it. so i took the cash out off my pocket and paid the full amount. first i wanted to restore it to like new conditions. luckily ive decided to keep it in its original state as it was and today still is. its made strong like a german tank. ive made a video shows me dancing on it without making even the smallest dent. the tyres still very good, not perrished in any way. ive checked its realy close the shape of the 1950th ferrari formula 1. about the ferrari branding im not sure its original or not. to me it looks more like selfmade. anybody knows anything? I would say it looks manufactured. The seat and flowing body panels would be very difficult to fabricate without the use of a heavy press and rollers. The number however appears too bright and undamaged? Could have been applied later. Tires and wheels look period correct. Regardless, this is on very nice child's racer! maybe the numbers are looking bright in the pic. to be honest, the same conditions as the rest of the branding and the paint of the body and seat. I can't read the advertisement. Is it for the car or for something else? 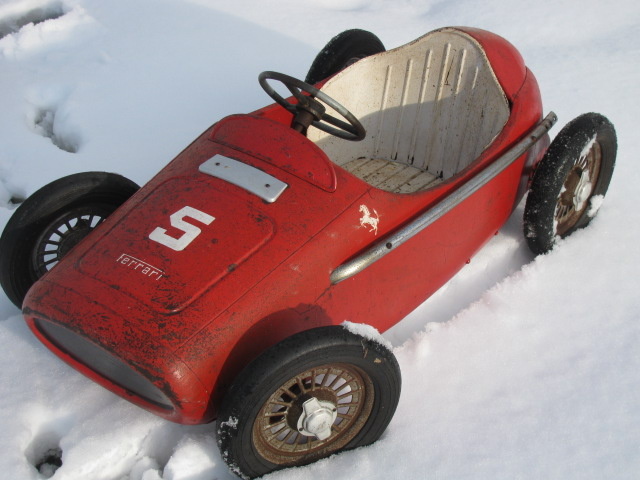 Having a pic of a similar toy car helps prove that it was manufactured, but when and by whom? Maybe you got one free when you bought a real Ferrari! its the back cover of the european biggest magazine for classic cars and bikes. that pedalcar is not my one. advertised by an insurance company some years for promotion. has an other start number. ive seen onother one with a different start number on the german tv for promotion also. 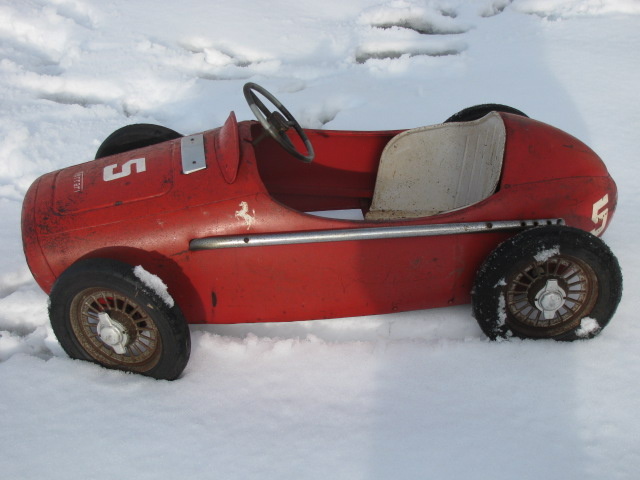 Along with the help of another pedal car enthusiast, I am confident to say that your car is a Morellet Guerineau Ferrari 1960. If you're thinking of getting rid of it, ship it here to the USA, I'd love to own it! I hope this helps.